Published: Feb. 11, 2014 at 09:25 a.m. Updated: Feb. 11, 2014 at 01:28 p.m.
After spending last offseason in a long and winding search for a new employer, Osi Umenyiora hopes to have a home with the Atlanta Falcons for at least one more year. 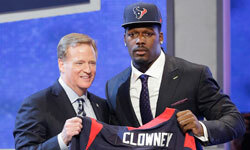 "I would love to stay, and I think I am," the pass rusher told ESPN.com's Vaughn McClure. "But you really never know what's going to happen." Umenyiora led the team last season with 7.5 sacks, but he's on the wrong side of 30 and set to count $4.75 million against the cap in 2014. Cutting ties would save the organization $3.5 million but would leave the Falcons dangerously short on difference-making pass rushers. Still, Umenyiora struggled down the stretch, recording just one sack after Week 12. He remained solid against the run but saw his snaps reduced over the final month of the campaign. One solution might be to employ Umenyiora as a situational pass rusher, a role he doesn't sound fired up for. "I would rather not," he said. "But whatever they tell me they want me to do, that's what I'll do." The Falcons have just one defender -- Akeem Dent -- who graded out positively chasing the quarterback in 2013, per Pro Football Focus. General manager Thomas Dimitroff added defensive ends Malliciah Goodman and Stansly Maponga in the later rounds of last year's NFL Draft, but this time around, Atlanta owns the sixth overall pick. We expect South Carolina's Jadeveon Clowney to be long gone by then, but the Falcons have an opportunity to remake their defensive front come May -- with or without Osi.